Ever since my last post on pizza dough, I spent a whole year making pizza with different doughs in a quest for the very best one. My roommates and boyfriend ate so much homemade pizza during my junior year of college that I was accused of making them fat. But it had to be done, even at the expense of the waistline of those nearest and dearest to me. (Who, by the way, are beautiful and not fat at all!) I strongly believe that the quality of pizza rests in the quality of the crust. 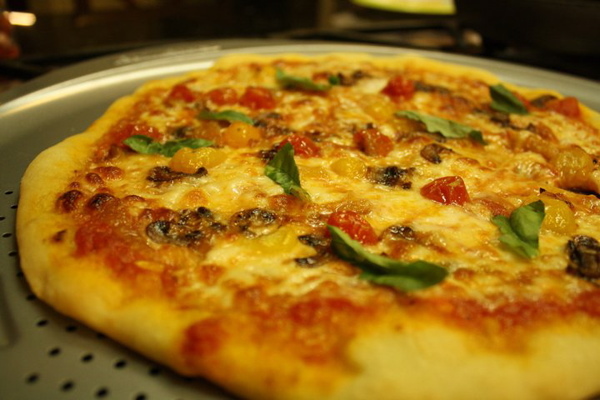 You can top a pizza with the most delicious toppings ever, but if the dough is crappy, or your technique for baking the dough is no good, then the whole pizza kinda stinks. Ya ya ya, you can just buy a really good pizza somewhere. I know this. I live within walking distance from one of the best pizza places in San Diego. So why waste all my money on bread flour, yeast, pizza stones, and pizza peels? Not to mention all of the cheese, tomatoes, basil and other toppings that each pizza requires? Pride. The answer is pride. Because in my world, nothing beats the satisfaction of creating a pizza, from start to finish, that is just as good, if not better, than any pizza you can buy in a 50 mile radius. It is an amazing feeling. The funny thing is, I was never a big fan of pizza growing up. I didn’t hate it. It was just another food item that my family occasionally ate. But after going to Italy and experiencing pizza as it was intended to be, I am completely obsessed. It is really the perfect food item. It is bread topped with anything you like. Anything. Plus cheese. (I love cheese). Then baked. Perfect meal. But I digress. While I learned a lot about mastering pizza dough from the school of hardknocks, I finally purchased Peter Reinhart’s Bread Baker’s Apprentice. This is a must have for anybody interested in baking bread. Inside this wonderful book is a recipe for “Pizza Napoletana”, and my quest for the perfect pizza dough ended. I will provide you with the bare bones of this recipe, just what I believe you need to make this recipe. In the book, this recipe takes up 6 pages and it is chock-full of tips and hints to make a perfect pizza dough. 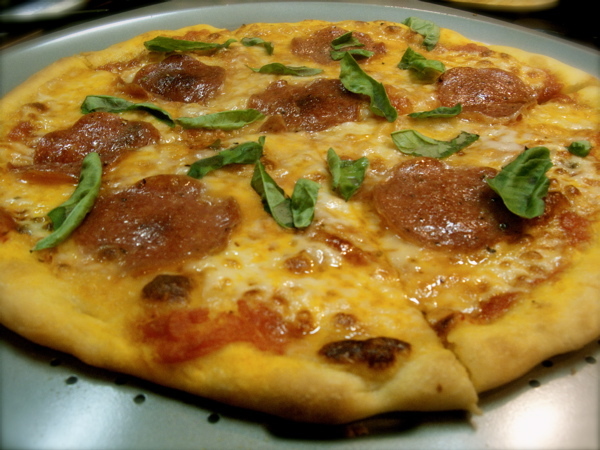 If you just want to try out pizza dough, just use this blog post. But if you are as serious as I am about pizza making, I highly recommend buying this book! Here is the recipe, but BEWARE: THIS CALLS FOR MAKING THE DOUGH THE DAY BEFORE!! 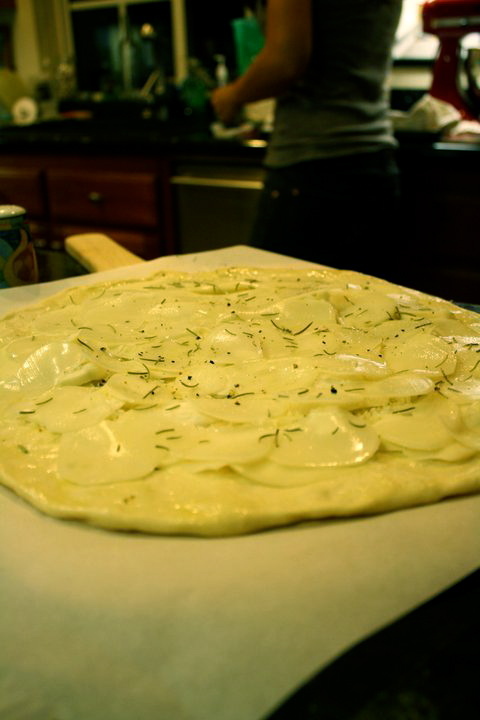 If you want the pizza the same day as you make the dough, you will not get the same results. One of the most important things I have learned is that most pizza dough recipes call for very similar ingredients, so this cannot be the most important part of pizza dough making, considering some turn out like crap and some are divine. It is how you handle the dough that matters. How you knead it, how you let it rest, how you allow the natural chemistry of flour+salt+yeast+water+oil turn into a delicious crust, and lastly, it’s how you bake it. Remember this, my grasshopper. 1. Stir together the flour, salt, and instant yeast in a large bowl (or in your stand mixer bowl). With a large metal spoon, stir in the oil and the cold water until the flour is all absorbed (or mix on low speed with the paddle attachment), If you are mixing by hand, repeatedly dip one of your hands or the metal spoon into cold water and use it, much like a dough hook, to work the dough vigorously into a smooth mass while rotating the bowl in a circular motion with the other hand. Reverse the circular motion a few times to develop the gluten further. Do this for 5 to 7 minutes, or until the dough is smooth and the ingredients are evenly distributed. If you are using an electric mixer, switch to the dough hook and mix on medium speed for 5 to 7 minutes, or as long as it takes to create a smooth, sticky dough. 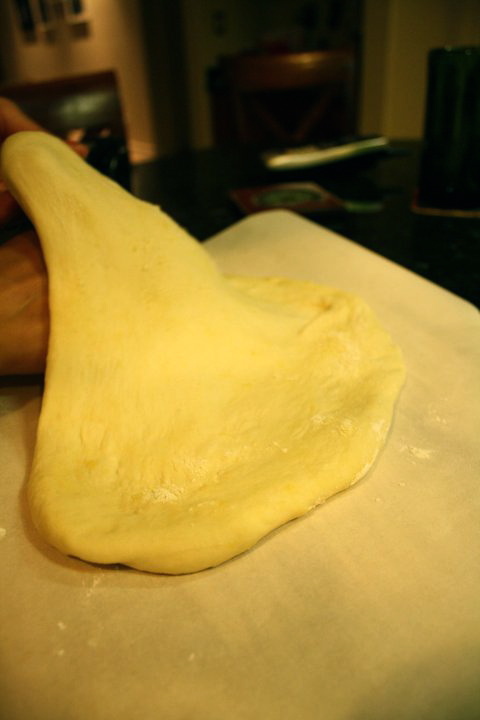 The dough should clear the sides of the bowl but stick to the bottom of the bowl. If the dough is too wet and doesn’t come off the sides of the bowl, sprinkle in some more flour just until it clears the sides. If it clears the bottom of the bowl, dribble in a tea- spoon or two of cold water. The finished dough will be springy, elastic, and sticky, not just tacky, and register 50 to 55F. 4. On the day you plan to make the pizza, remove the desired number of dough balls from the refrigerator 2 hours before making the pizza. Before letting the dough rest at room temperature for 2 hours, dust the counter with flour, and then mist the counter with spray oil. Place the dough balls on top of the floured counter and sprinkle them with flour; dust your hands with flour. 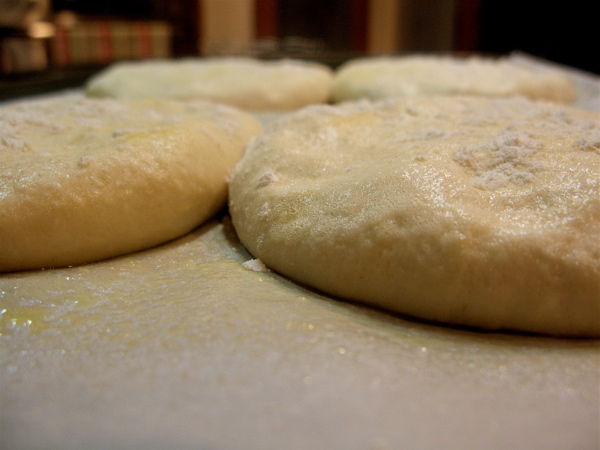 Gently press the dough into flat disks about 1/2 inch thick and 5 inches in diameter. 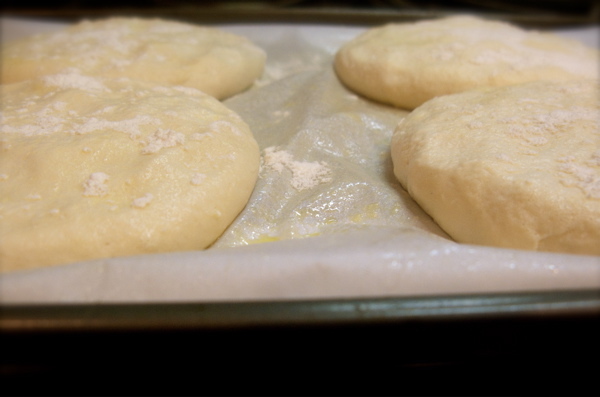 Sprinkle the dough with flour, mist it again with spray oil, and cover the dough loosely with plastic wrap. I just placed a tea towel over mine. Now let rest for 2 hours. (It may take a little longer depending on how cold your kitchen is). 5. At least 45 minutes before making the pizza, place a baking stone on a rack in the lower third of the oven. Heat the oven as hot as possible, up to 800F (most home ovens will go only to 500 to 550F, but some will go higher). I put mine at 500F. 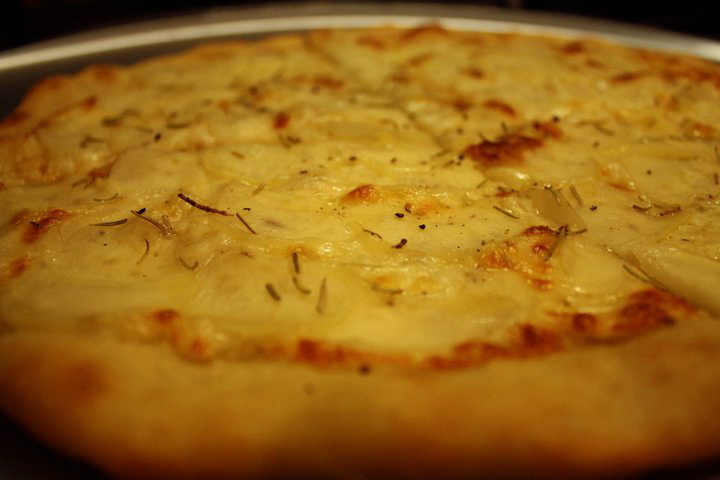 However, for my potato pizza, I put it at 450F, because it needs to cook a little slower for the potatoes to cook right. If you do not have a baking stone, you can use the back of a sheet pan, but do not preheat the pan. 6. Generously dust a peel or the back of a sheet pan with flour. However, I have began to assemble mine on parchment paper that I place on my peel and then dust with a little bit of flour. This is a surefire way to prevent disasters, such as pizza not coming off of your peel or the pizza being too thin and then coming apart and sticking to your stone in the oven…not that this ever happened to me, of course. It has. Many times. Then, make the pizzas one at a time. Dip your hands, including the backs of your hands and knuckles, in flour and lift I piece of dough by getting under it with a pastry scraper. 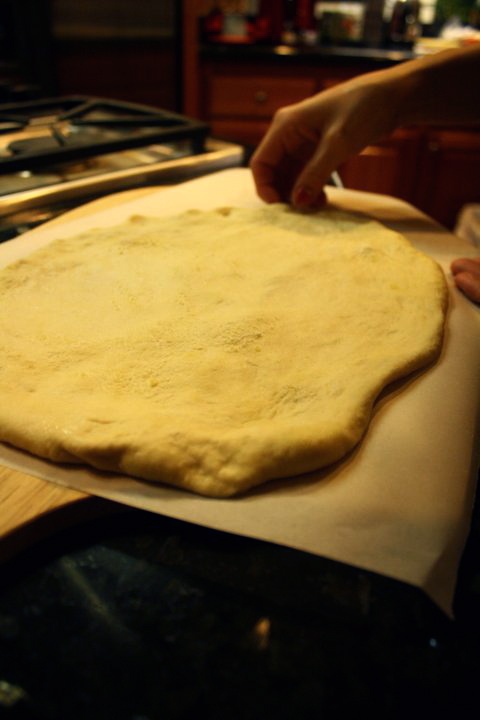 Very gently lay the dough across your fists and carefully stretch it by bouncing the dough in a circular motion on your hands, carefully giving it a little stretch with each bounce. If it begins to stick to your hands, lay it down on the floured counter and reflour your hands, then continue shaping it. I like to just pull and stretch mine until it’s as thin and large as I want. If it tears, you can patch it up. But this dough should be really easy to work with . Please don’t use a rolling pin on this dough (or any dough), but if that’s the only way you can do it, so be it. But know that the texture of the final crust will not be as good. 7. When the dough is stretched out to your satisfaction (about 9 to 12 inches in diameter for a 6-ounce piece of dough), lay it on the peel or pan, making sure there is enough flour to allow it to slide. 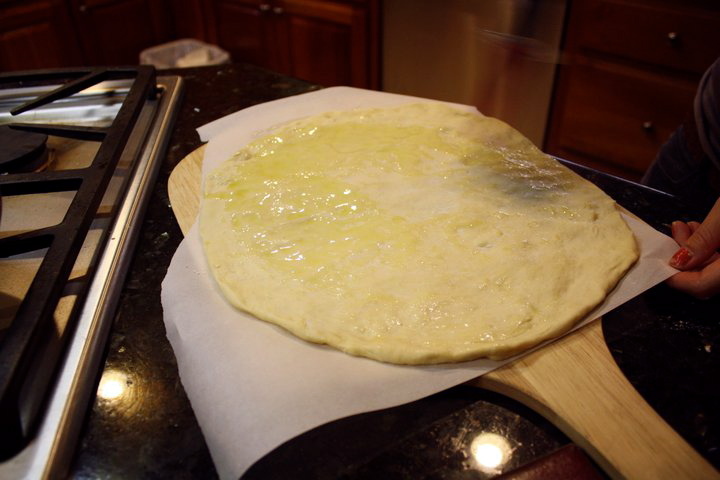 (Or just place on the parchment paper that you will slide onto the pizza stone along with the pizza or keep on the pan that you will place in the oven). I always brush mine with a light coat of olive oil and then sprinkle on some seasoning, such as salt or dried herbs, especially along the edges so that the crust browns and is tasty. Spread on a thin layer of sauce and then your other toppings, remembering that the best pizzas are topped with a less-is-more philosophy. The American “kitchen sink” approach is counterproductive, as it makes the crust more difficult to bake. A few, usually no more than 3 or 4 toppings, including sauce and cheese is sufficient. 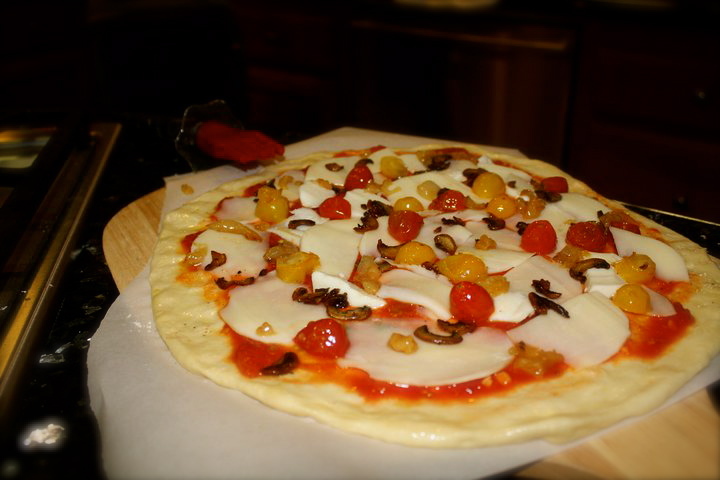 Because this is a thin crust pizza, keep the toppings light, (and remember to remove as much moisture as you can from fresh cheese and veggies that are high in moisture, such as tomatoes and fresh mozzarella, because they can cause a soggy pizza, yuck). I then like sprinkle on a little more seasoning, like a little sea salt and fresh ground black pepper. 8. Slide the topped pizza onto the stone (or bake directly on the sheet pan) and close the door. Wait 2 minutes, then take a peek. If it needs to be rotated 180 degrees for even baking, do so with your peel. The pizza should take about 5 to 8 minutes to bake. If the top gets done before the bottom, you will need to move the stone to a lower self before the next round. if the bottom crisps before the cheese caramelizes, then you will need to raise the stone for subsequent bakes. 9. 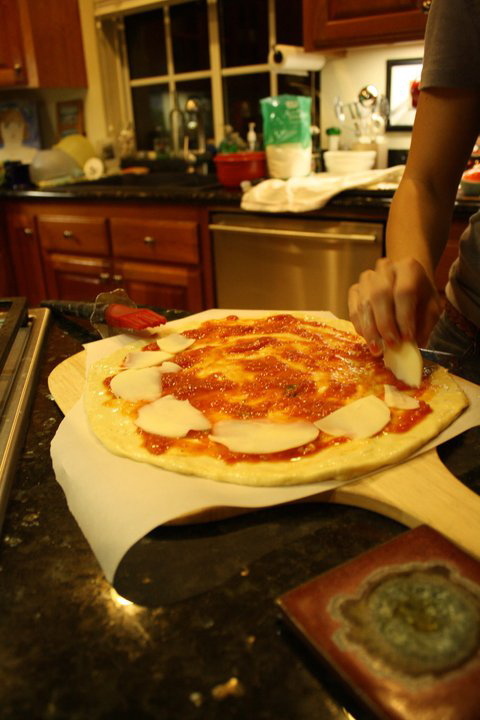 Remove the pizza from the oven and transfer to a cutting board. 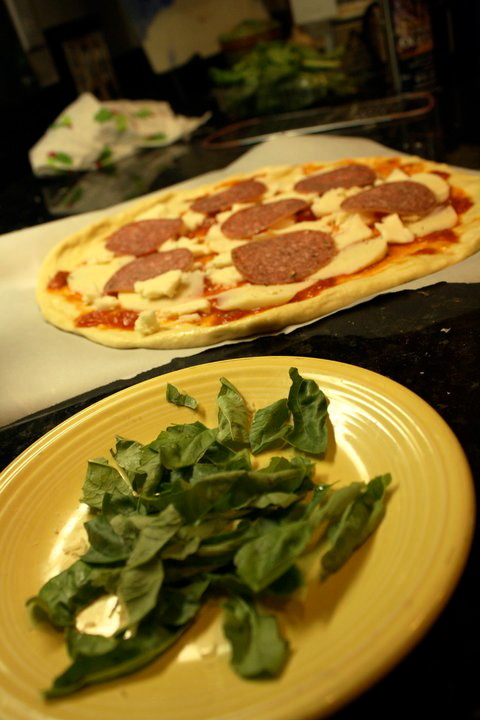 If appropriate, top with some fresh torn basil leaves. Wait 3 to 5 minutes before slicing and serving, to allow the cheese to set slightly. Then scarf it down like there is no tomorrow. this one was good enough that I will post on it later! brynnn you are the best pizza chef ever! Great article and recipe well written Brynn. You are now ready to open “Panpizza Brynnies” the authentic Italian pizza parlor. You could make a fortune! Can I leave the dough ball as just one big dough ball? Or is it necessary to make smaller dough balls? The point of forming the balls is so that they are ready to form into pizzas when they are done rising. I like smaller balls since my pizza stone isn’t very large. I can usually stretch one ball out into a nice and thin “medium size” pizza. If you are more comfortable working with a large amount of dough and have the room to bake a very large pizza, then you can definitely just make one or two large balls. But if it ends up being too much dough, just be aware that when you split it up to make smaller balls, you’ll have to let them rest for another 30 minutes or so to ensure they will be easily stretched out.